It is the time of the year, when people say goodbye, reflect on what they have gone through the year and say hello to the new year. In 2013, I have started blogging and learning Japanese again. I have tried writing a Chinese novel. What you may not know, I have been learning how to cook too. I learn how to cook after I am married. Before that, I did not even know how to pan-fry a sunny-side up egg. I always ended up with something between sunny-side up egg and scrambled egg. I found out that I am afraid of the heat from the fire, and thus whenever I wanted to crack an egg, my focus was on the fire, not the egg. That’s why I could not get a nice and round sunny-side up egg. 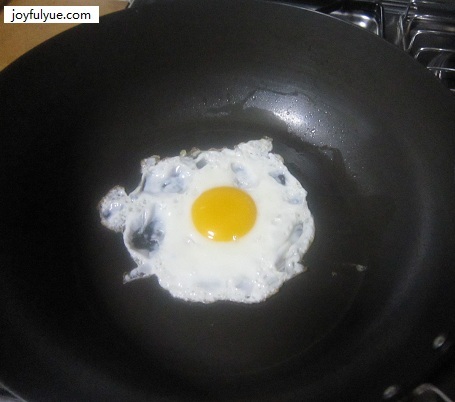 Now, I conquer the fear of the heat and manage to get a sunny-side up egg as in the picture below. Finally, a sunny-side up egg. To all single ladies, home cooking is healthier. Even if you are not getting married any sooner, learning how to cook brings more benefits than having meals outside. To all students, when you face obstacles in studies, try to find out what is the problem and conquer it. Once you conquer your problem and your fear, you find yourself at a new height. What you need to do next is to keep practising; practice makes perfect. Oh, yes, do not forget to put your focus at the right place. What have you learnt in 2013? Let’s bring it forward to 2014! By Wendy in Life and Science on 31/12/2013 .